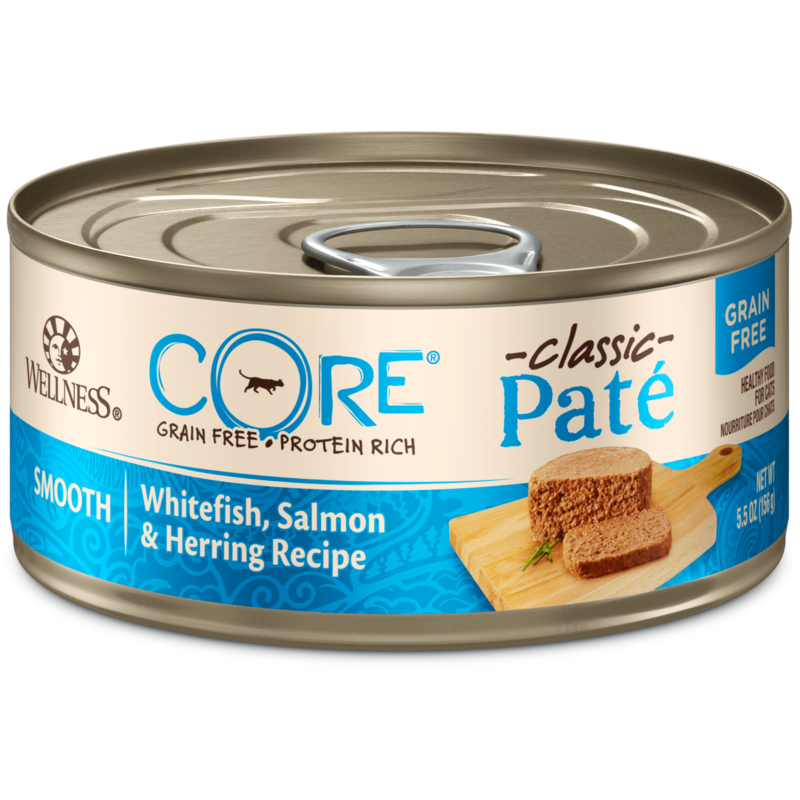 Whitefish, Salmon Broth, Salmon, Tuna, Herring, Dried Ground Potatoes, Canola Oil, Ground Flaxseed, Carrageenan, Guar Gum, Salmon Oil (preserved with Mixed Tocopherols), Cranberries, Potassium Chloride, Taurine, Salt, Choline Chloride, Dried Kelp, Yucca Schidigera Extract, Chicory Root Extract, Iron Proteinate, Zinc Proteinate, Thiamine Mononitrate, Vitamin E Supplement, Manganese Proteinate, Copper Proteinate, Niacin Supplement, d-Calcium Pantothenate, Sodium Selenite, Biotin, Riboflavin Supplement, Pyridoxine Hydrochloride, Vitamin A Supplement, Vitamin B12 Supplement, Folic Acid, Potassium Iodide, Vitamin D3 Supplement, Rosemary Extract. 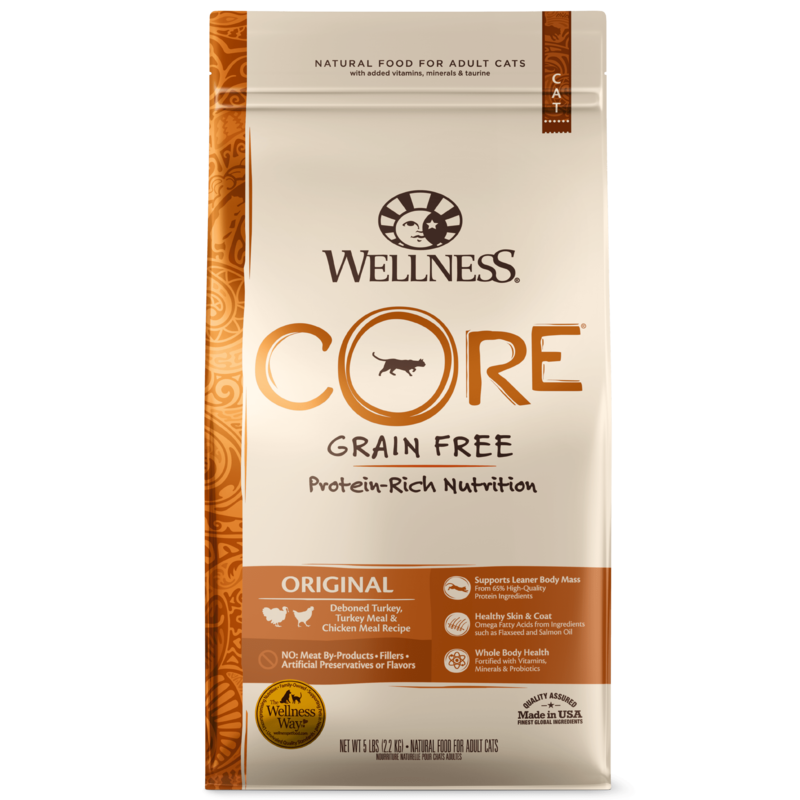 Wellness CORE Salmon, Whitefish & Herring Formula is formulated to meet the nutritional levels established by the AAFCO Cat Food Nutrition Profiles for all life stages. FEEDING INFORMATION: Serve at room temperature. Cover and refrigerate unused portion. 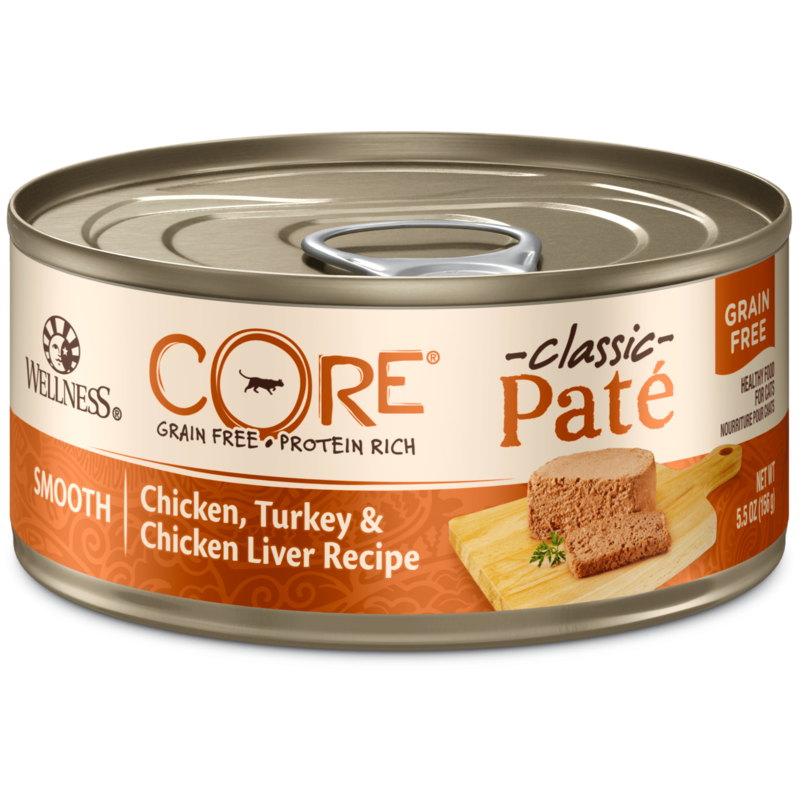 The amount of food your cat requires depends on age, activity level and environment. Always provide access to clean, fresh water. When fed alone to adults, feed 156g per 3kg of body weight per day, for kittens up to twice this amount and for mothers up to three times this amount. For combination feeding, reduce 30g for every 1/2 can wet.